Managing Partner Celebrates Birthday; September 27th. Aderibigbe Adedeji David known as Dejimanaire King David the managing partner of Dejimanaire King Entertainment & Aridunu.com on the 27th September celebrates his birthday. He wishes to contribute his own quota to humanity and to live a life that is worth emulating. Aderibigbe Adedeji David – Dejimanaire King David is a writer, blogger, volunteer, I.T enthusiast, public speaker, innovator, succinct analyst, down to earth, energetic, expressive, assertive, humorous, jovial, fun loving, pragmatic, teachable and God fearing man. He has weaknesses that he alternatively work upon toward a relative strength. He is not perfect but he aims towards perfection. Dejimanaire has a University degree in Tourism Studies however, his primary interest lies in I.T. Vast in general computer usage in Windows, Apple and Andriod operating systems with specific skills in Technical Hardware Troubleshooting, Website administration, Internet usage, MS office suites, Paint, SQL, Web Development using WordPress, Impress Pages, Joomla and other related CMS. Also knowledgeable in Video Editiing using Adobe Creative Suites. Adedeji is inspired by everything around him and faces his challenges strategically, practically and squarely with an understanding of timing. He pays strict attention to details and also take things seriously un-serious. His flag note are hard work, integrity, self belief/acceptance/reliance. He sees the good in the bad and bad in the good. He is positively minded and an excellent socialite. David’s long term goal is to be successful in his three major enterprise, which are Dejimanaire King Entertainment , Aridunu.com and being the first person in Nigeria to altruistically donate blood the highest number of times following the record of Phil Baird in Australia who has an accumulation donation of 103.96 litres in 2010. Aderibigbe Adedeji David believes nothing is permanent and thus living life to the fullest for the NOW and the brighter future with an unforgettable mindset of passing a unique legacy to the new generation. 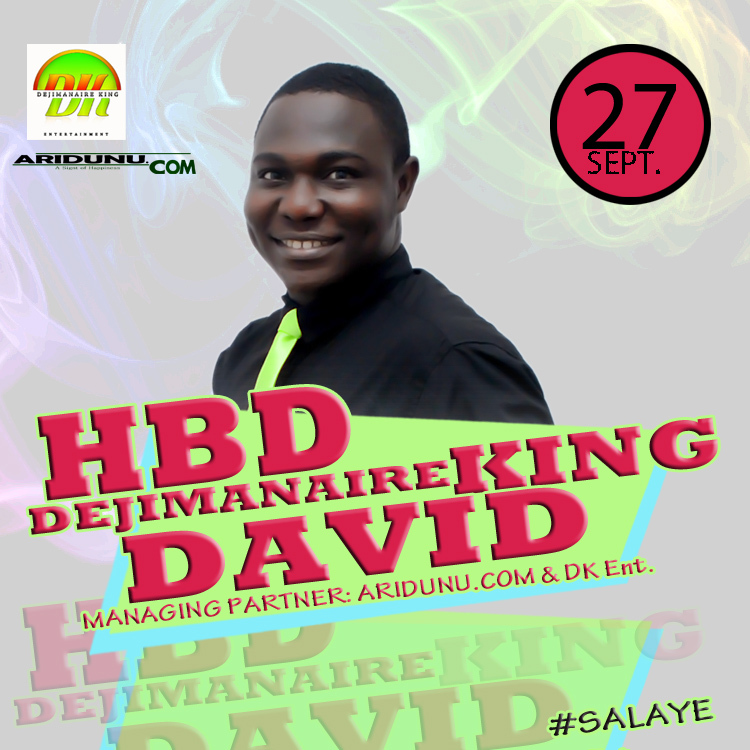 DejiKing Entertainment: Managing Partner Celebrates Birthday; September 27th.